Any number of reasons may prevent people from living normal, functioning lives without the need for daily assistance. These include congenital conditions, accidents and injuries, developmental or cognitive disabilities, mental or emotional issues, illness, age and more. No one should have to waste good years in their lives due to lack of help, though, which is where a career in occupational therapy comes in. Occupational therapists help others navigate the struggles of daily life, made even more challenging by their various conditions. Helping people recover or learn to manage their disabilities can be an extremely rewarding way to spend one’s time, and can make a significant difference to a patients’ quality of life. If you’ve been looking for a career that enables you to help people, work on your feet, stay abreast of current medical trends and work with population groups that interest you, occupational therapy could be a great fit. If you’re ready to learn more about your potential new career, grab a notepad, and let’s dive in. Occupational therapy is a field that helps injured, ill or disabled people engage in the activities of everyday life. Therapists do this by exposing people to those activities and helping them find ways to complete tasks that might be too difficult without help. They assign exercises, and walk people through the steps to complete them, helping them improve their skills over time, until they reach either full recovery or reach their peak abilities. While you may choose to work with individual population groups, the field itself spans the entire human lifespan, from infants to the elderly. While the word “occupation” might make it seem as though the practice relates only to jobs and careers, it is actually referring to any activities and pastimes in which people take part in with regularity. Occupational therapy involves assessing clients, determining reasonable goals for the client, meeting with families to take their hopes and opinions into account, offering individualized treatment plans, customizing interventions, working with schools or other organizations, and evaluating outcomes. Occupational therapy is a holistic career, striving to meet the needs of the “whole patient” rather than simply treating one symptom or injury. The practice is highly evidence-based, drawing on any number of scientific approaches and studies to address individual conditions and issues. An occupational therapist, at the most basic level, helps people get through the day. They enable people of all walks of life and all ages engage in activities related to work, play, family duty and more. The ongoing goal of occupational therapy is to improve the patient’s physical and mental health, help individuals cope with setbacks and trauma, and assist in as full a recovery as possible. Recovery is not always possible, however. Some conditions are permanent, in which case an occupational therapist helps the individual use tools and strategies to navigate the situation. In the case of cerebral palsy, for instance, the occupational therapist helps the patient learn to use equipment such as wheelchairs, eating aids, leg braces, home supports such as handrails or motorized apparatuses, and more. Such techniques help people function more independently, even if they always need assistance. Therapists may work with groups, such as children, the elderly, people suffering from a specific condition, car accident victims, people with spinal disabilities, adolescents, and so on. No matter whom the therapist is working with, a prime tenet in occupational therapy is taking the needs and opinions of the patient into account always. In this sense, patients themselves are part of the therapeutic team, always ensuring they have as much agency as possible. Occupational therapists frequently work in educational settings, where they are responsible for assisting children with special needs or helping students pursuing higher degrees to navigate the complex worlds of colleges and universities. They may help advocate for individuals, modify classrooms to accommodate disabilities, help people participate in a range of school activities or plan interventions to reduce the impact of disabilities in later life. They may also work with adults or the elderly who have experienced accident or trauma. This can take many forms, from making home visits to advocating with healthcare staff and teaching individuals the exercises they need to function more fully. It may also mean helping patients rehabilitate after surgeries, accidents and injuries. Some occupational therapists focus on rearranging or modifying work environments to accommodate people with disabilities or reduce the chances of chronic use conditions (such as carpal tunnel or bad backs from lifting). They may also perform advocacy roles in these settings, meeting with employers to help patients get the modifications they need to make work possible, and hopefully successful. Occupational therapists often work in mental health treatment centers or psych wards; hospitals and clinics; nursing homes and retirement facilities; and rehabilitation centers, where they help patients recover from addiction and substance abuse. In this capacity, they frequently work closely with doctors, nurses and specialists. They may also have more specific titles. In schools, for instance, occupational therapy often takes the form of speech pathology, audiology or physical therapy. In nursing care facilities, they may help newly hearing-impaired individuals learn other ways of communication, or teach people who have suffered blindness to read Braille. Occupational therapists also frequently work in private practice. They may work alone, or hire support staff. Because it is a growing field, occupational therapists have a wide variety of choices about how they’ll work as well as where they will work. You can find employment as an occupational therapist anywhere in the United States, and several opportunities exist abroad as well. You might work with international aid organizations, refugee camps, non-governmental organizations, nonprofits and more. The wide need for occupational therapists means that if you want to switch focus, you’ll likely be able to find a job in your new field quickly – a nice perk. Lastly, many occupational therapists work in home health care, visiting patients’ homes to provide assistance with regular tasks, to clean and make meals, to oversee exercises and other activities, or to make recommendations about the setup of the home and any necessary safety measures. Occupational therapy typically makes for a busy schedule. Most occupational therapists work full time, with only about a quarter working part time. Many work nights and weekends to help patients who have full time jobs and would otherwise be unable to get assistance. The fast pace of the job may be challenging for some, so it’s important that you draw firm boundaries about when you will be able to work and plan for enough R&R to be successful in the role. Be aware that occupational therapy shares many traits as nursing and other professions that work closely with the human body. This means you may have to deal with wounds or body fluids, which is not for the faint of heart. By far one of the biggest challenges, however, is that you will not always be able to help your patients improve. This can be heartbreaking, especially in the case of children. Sometimes, though, exercises and accommodations simply can’t overcome the trauma of an accident or the disabilities brought on by a certain condition. In these cases, it can be very difficult to break the news to a family and to watch patients pass away, or live with their severe limitations. The only option in such situations is to do your best, helping individuals move through fear, sadness, confusion and discouragement as best you can. Remember that one of the roles of an occupational therapist is to provide support, even if it is only emotional. Typically, occupational therapists make a comfortable living. The average salary is around $82,000 per year, which breaks down to roughly $39 per hour. The field is growing at a rate of 27 percent, which is much faster than average – a fact largely accounted for by aging baby boomers. Since the world’s population is growing, there will only be more work for occupational therapists, so you can feel confident in gainful employment for the long haul. The main distinguisher between occupational therapists and other health practitioners is that they work hard to ensure individuals get what they want out of life. This is not to say that doctors or nurses don’t care about their patients, because of course they do. But whereas medical practitioners follow an established set of procedures and protocols to help their patients, occupational therapists have more freedom to design treatment plans and support systems that match the needs and desires of individual patients. A master’s degree is usually required to work as an occupational therapist. This is true whether you’re being hired by an institution or going into practice on your own. Both your bachelor’s and master’s degrees must be earned through accredited institutions, after which you will need to complete supervised fieldwork to receive your license. Licensing requirements vary by state, so ask your school or local state board about them. 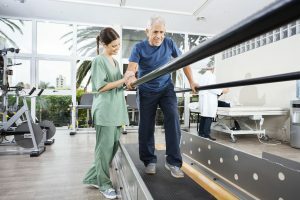 In some cases, occupational therapists choose to earn doctoral degrees, which allows you to practice at a higher level, typically with greater specialization regarding your population or techniques administered. You can always go back to school later, however, so don’t view this as a decision you must make now. At the end of the day, occupational therapy is perfect for those who want to spend their time working with others toward a more complete, more fulfilling and happier life. If that sounds like a career that would make you feel complete, fulfilled and happy, then it could be a match made in heaven.